When Caroline Goodman-Thomases was a little girl, her dreams ran fast, and a little wild. "I was obsessed with horses," explains the elegant, red-headed equestrian, who—wearing knee high boots and riding pants—looks like she could jump on the back of one of her five horses and gallop off at a moment's notice. Growing up in Rockland County, where her father was in the horse business and her neighbors were farriers, she was immersed in her passion from a very young age. "My neighbor and his wife had horses, and knew that I loved them, so he cut a hole in our fence and built me a gate. I could go and play with the horses anytime I wanted," she recalls. 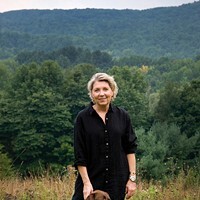 Goodman-Thomases took her first official riding lesson at age seven and began officially working on horse farms by age 12, helping to care and train for the creatures she loved. By the time she was a teenager she was competing with show horses, and accomplished in both jumping and dressage. As for her fantasy abode? It wasn't a castle, or a beach house or a big city apartment. "I had a fantasy barn," she says with a laugh. The large map her six-year-old self drew of it—on construction paper, complete with detailed paddocks and stalls sketched in crayon—is now framed and hanging in the sunny office she shares with her partner, James McKenna. 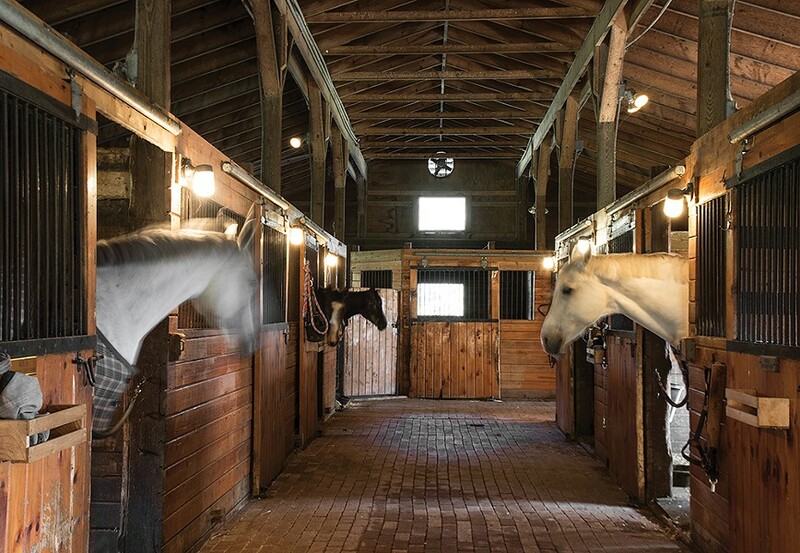 Adjacent to the barn they've just spent a summer renovating, the office is the center of the couple's recently launched business Thomases Equestrian, where they train horses, teach riding, and board the graceful, intelligent beasts. 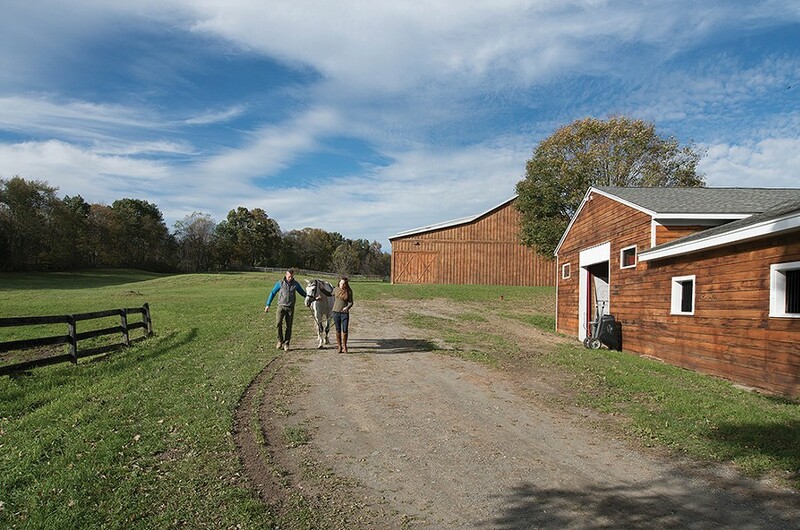 The barn and office are just one part of their newly purchased 40-acre farm in Clinton Corners, a rambling property in the heart of horse country that also includes an 18th-century farmhouse, stables, and a large covered riding arena, as well as lush paddocks and open fields for riding. It's a place Goodman-Thomases's six-year-old self might be delighted by. McKenna grew up with a similar connection to the wild. A native of Northern Ireland, his family lived in an old stone vicarage turned cattle farm. "I come from a farming background with dogs running around and roosters. The 'wood world' was just there all the time," he remembers, describing the ever-present natural world that surrounded him in childhood. "We had horses, too, but we would jump on with no saddle and run around like idiots." As a young adult, he learned carpentry and apprenticed as a mason, then came to the United States to play Gaelic football. ("Where I come from," he explains, "we were trained like pedigree horses to play the sport."). He soon got a job with the construction firm Structure Tone and began working in New York City, furthering his knowledge in the trades. 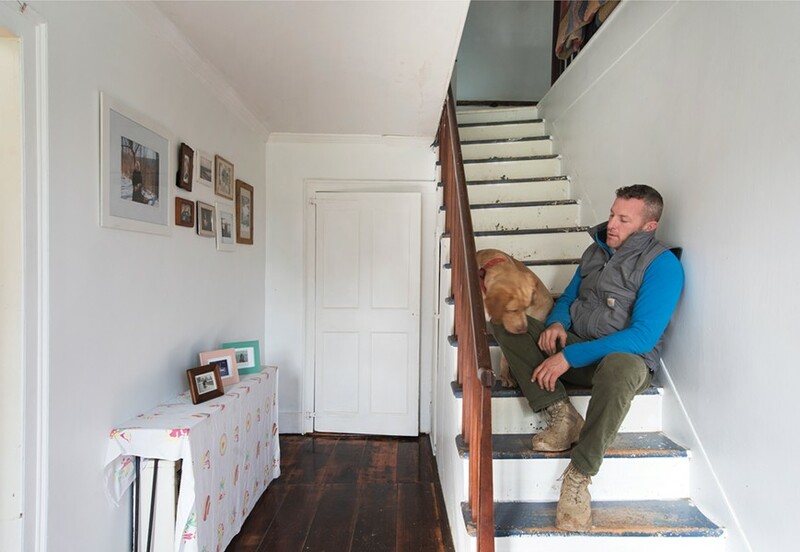 Although renovating the farmhouse and barn while starting their new business has been a challenge, it's one they're up to. "Luckily, Jimmy and I have a good skill set," explains Goodman-Thomases. "I have the horse experience, and he has the farming and the construction background." Originally an assistant and producer in the film business, working on films such as Ricki and the Flash and The Belles of Greenlee County, Goodman-Thomases decided to commit to a full-time equestrian career four years ago. 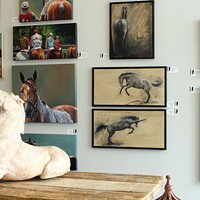 She began a small business teaching riding skills, as well as boarding horses, in Rockland County. As her business grew, she realized she would need more space. "We needed to find a place with more freedom, where the horses could run around and be the way horses are naturally made to be," she explains. The couple began looking upstate, on the east side of the Hudson River. 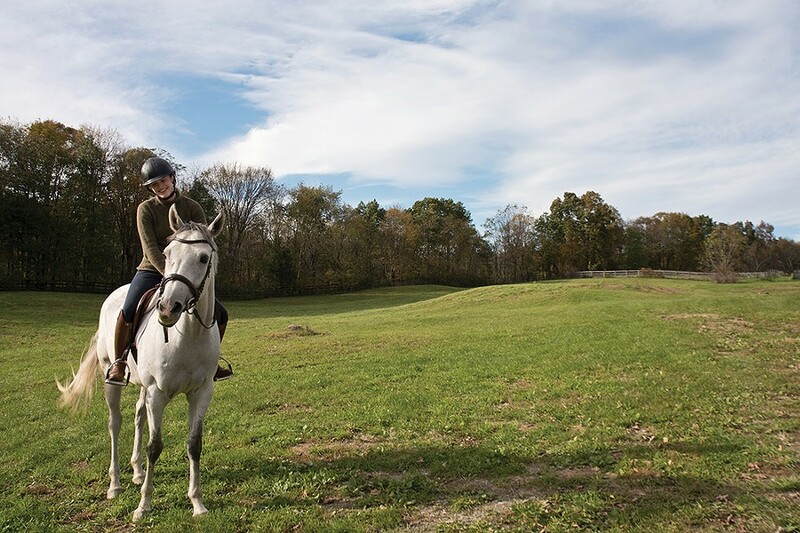 "This area is great for horses," she says, describing the confluence of fellow horse lovers, who gravitate to the rolling hills around Rhinebeck and Millbrook, as well as HITS in Saugerties. 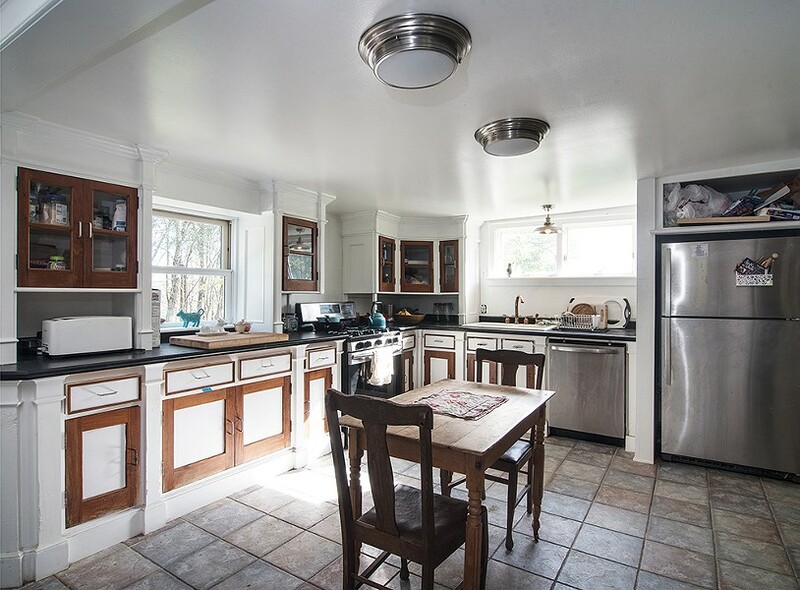 The two first thought of renting something in the area, but then stumbled onto the listing for the vacant farm in Dutchess county. The property, empty for five years, had fallen into a state of disrepair. "It looked pretty scary from the pictures," remembers Goodman-Thomases, "but we could tell it had good bones." Built in the 1790s by farmer Zadock Southwick, the original farmhouse, and a barn, were once the center of a tannery, with the house added onto throughout the 19th century. The stables most likely were built in the 1970s, when the farm was owned by a show jumper who used it as a breeding facility for race horses. However, the years of neglect had left the place feeling eerie. "Nature had really taken over," McKenna remembers. The bushes and trees were overgrown, water damage and neglect had left the stables in a shambles, and a number of bird species had moved into the former horse arena and taken over. They knew making it livable for humans or (domesticated) animals would take some work. "You don't want to bring your horses to something that looks like a haunted house," explains McKenna. Even so, the couple decided to take the leap, buying the property in March and moving in during the spring. They dove into the renovation right away. Their first priority: creating a safe, inviting environment for their horses. Along with Goodman-Thomases' first horse, Paddington—a chestnut quarter horse she's had for 18 years—the couple also has a grey Holsteiner called Willoughby; two Throughbreds called Nola and Finn; as well as Bonita, a chestnut pony Goodman-Thomases utilizes for lessons. 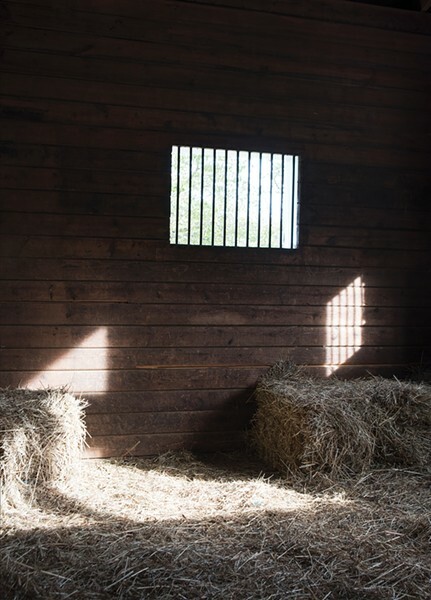 The horse barn and stable was the first structure they rehabilitated. First, they cleaned and refinished the 24 wooden stalls and then repaired the interior iron hinges and latch work. They also restored the stable's original floor of loose inlaid bricks, which now resonate with the rattle and clack of hooves and boots. The entire outside of the green painted structure needed refurbishing as well. "It was a bit decrepit," admits McKenna. They began by stripping the paint from the siding and then powerwashed the boards, uncovering cedar wood beneath. When they saw the powerwasher was actually damaging the cedar, they turned the shakes over. "We took a board or two off and realized it was lovely," explains McKenna. They thought the slight water staining gave the siding character, so they sealed the boards as is. 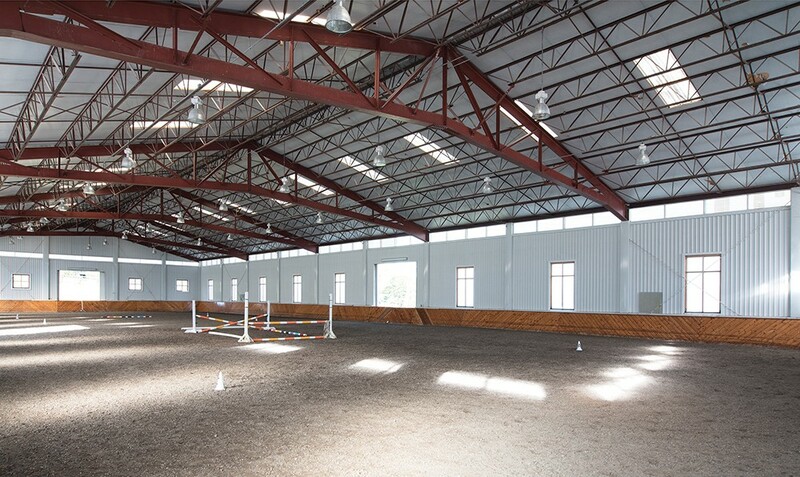 Next, they had to repair the indoor arena and get it up to working order. Nests lined the ceiling beams and covered the window sills, and the interior walls and floors had turned completely gray with bird droppings and feathers. McKenna cleared the birds out from the 233-foot long, 80-foot-wide structure and then, clad in a wetsuit, cleaned the ceiling and walls with a powerwasher and ladder. Now, it's a space fit for champions to practice throughout the year. 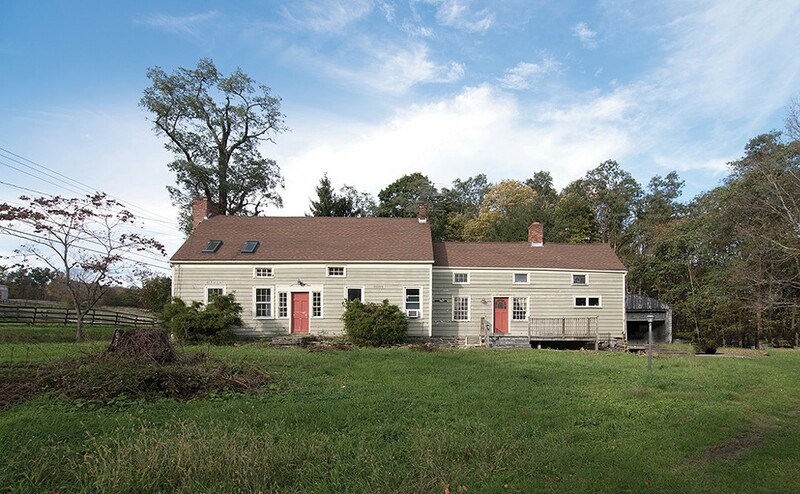 After clearing and repairing fields and fences, they turned their attention to their 1790 post-and-beam farmhouse. Centered around a large floor-through brick hearth and fireplace, the 1,020-square-foot home's first floor has a large farmhouse kitchen and the home's original living room, with wide plank wood floors and the original front door. With the original iron cooking spit still in place, the fireplace also has a "hotbox" above the hearth for keeping bread warm, and an additional built-in cupboard utilized for 18th-century cooking. 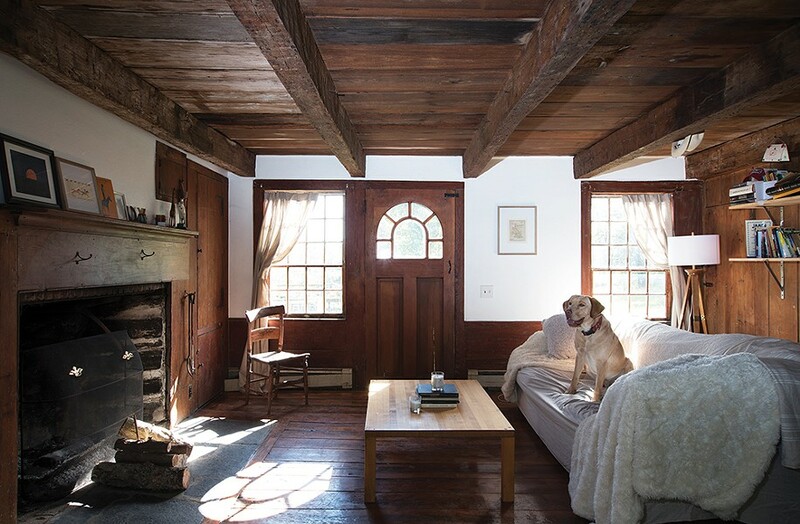 Along the living room ceiling, the original hand-hewn beams are held together with wooden pegs. The room was expanded in the 18th century with a hallway leading to an additional wing of the house, and eventually skylights were also added above the hallway. 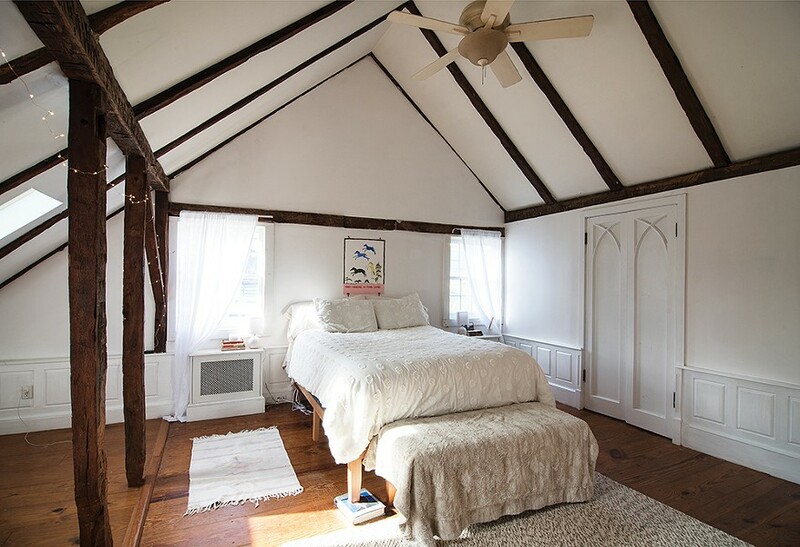 Here, McKenna sanded the wide plank floors of a parlor where a red brick fireplace, white painted walls and crown molding give this wing a 19th-century air. A hallway with an additional exterior door, as well as a dining room, complete the downstairs. Upstairs, a warren of hallways, closets and four bedrooms offers views to the surrounding fields, paddocks, and woods. The master bathroom, recently redone with blue tile, retains the old tub. It was while repairing pipes behind a wall of the second floor that McKenna realized the farm had, in its own way, come full circle: The original wall underneath was made of cement mortar bound by horse hair. The master bedroom, complete with a full cedar closet, looks through exposed vertical beams towards the west. The north-facing window, right next to the bed, offers a full view of a paddock. 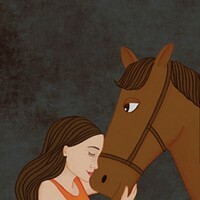 "That was always my dream," says Goodman-Thomases, "To wake up, look out the window, and see my horse in the field."